Welcome to the page of the subject German. 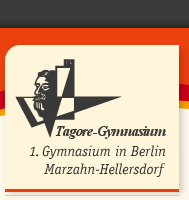 said Rabindranath Tagore, teaching comprehensive learning processes, which especially play a decisive role in German. The chief point in this subject is the widening of knowledge of languages as well as the employment of the language concerning the main skills like reading, writing, speaking and listening. Thus starting from the school year 2008/2009 the students of the 7th classes will work more intensively on the command of the language and literature in 5 hours of the week. During a phase from just about eight weeks at the beginning of the school year, the assessment of the basic knowledge of all students is carried out and deficits concerning the control of the language, spelling and reading are removed. With the development of specialized contents we also concentrate on methodical and social learning, among other things in the methods, - communication and team training of classes 7-9. The students get well prepared for the new forms of examinations (MSA, i.e. presentational examination and the presentational examination during the A-levels), by acquiring chief skills like for example teamwork.